Kenny Kellogg: A Kenny Kellogg Fan Club? Dave's blogging platform is Tumblr (which I love but I'm stuck on Blogger). The coolest part of Tumblr is that you not only post content on it, but read other blog content through it. Tumblr acts like a Blog Reader too. 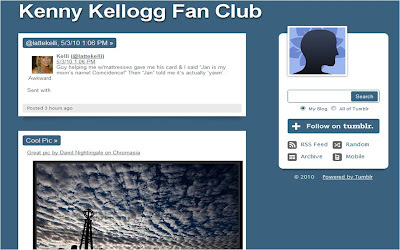 So Dave finds that he never checks Kenny Kellogg because it doesn't appear in his Tumblr stream. He told me this at dinner on Sunday night and I gave him a bad time. He was man enough to step up and create a hack that imports my feed & full post into Tumblr. The Kenny Kellogg Fan Club was born!